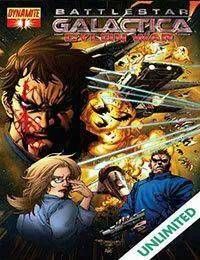 Part 1 of Dynamites explosive Cylon War series! Before the time of mankinds exodus from the twelve colonies (as told in the current, award-winning Battlestar Galactica series on SCI FI) and the returned menace of the Cylons, a war was fought between man and machine. A story that has never before been told, until now....Featuring eight pages of production art and script excerpts!